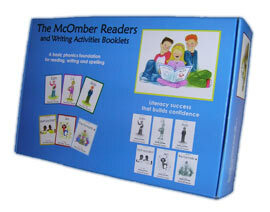 A total of 52 McOmber Readers, 52 Writing Activity Booklets divided into 10 Sets, and a Teaching Guide. Each Set includes 5 Readers and 5 Writing Activity Booklets except for Set 10. Set 10 includes 6 Readers and 6 Writing Activity Booklets plus a bonus book. Sets 1-5 introduces the short vowels. Set 6 introduces the long vowels with an e at the end of the word changing the short vowel sound to a long vowel sound. Sets 7-10 introduces and reinforces intermediate skills of vowel patterns such as: ee, ea, ay, ai, igh, ew, oa, ow, ou, au, aw, oi, oy, oo as well as common prefixes, suffixes and sight words. Bonus Book “Chatsworth” after Set 10 reinforces high frequency words for further reading enhancement. Teaching Guide gives detailed instruction on teaching with great resources.